Below you can find the life cycle for each version of application Google Chrome, like Google Chrome 72.0.3626, including release dates and end of life (EOL) dates. Google Chrome is a freeware web browser developed by Google. 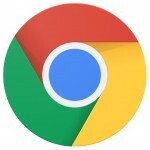 Google Chrome is also the main component of Chrome OS, where it serves as a platform for running web apps. The browser was first publicly released on September 2, 2008 for Windows XP and later, with 43 supported languages, officially a beta version, and as a stable public release on December 11, 2008. Google Inc. is an American multinational technology company that specializes in Internet-related services and products.